Perth, such a glorious city, a thriving cosmopolitan city with great dining, nightlife, and shopping. Perth is the the capital of Western Australia. 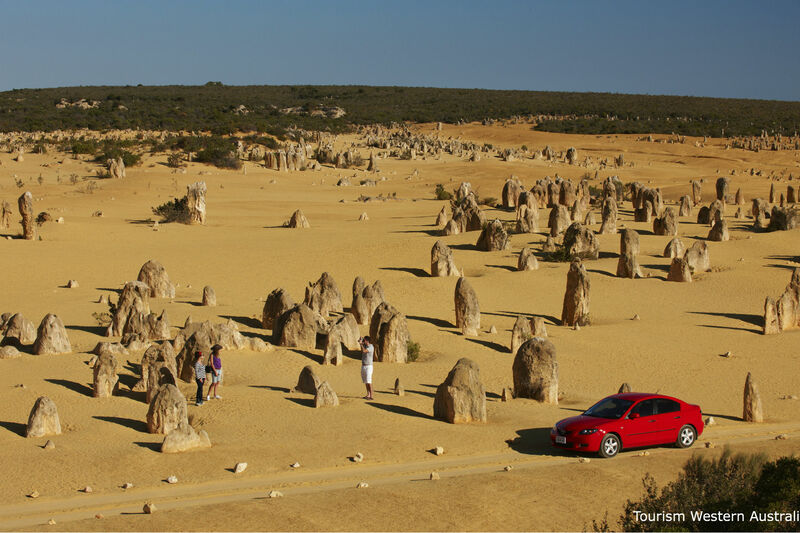 Did you know that Western Australia amounts to a third of the area of Australia? It is large! Perth is absolutely worth a visit. For you to understand the distance Perth is from the east coast of Australia I have included some interesting facts. Perth is 4110 kilometres from Sydney, to put that into perspective, Sydney is only 2,430 kilometres from Cairns. Melbourne is 3,387 from Cairns. Once you get to Perth make sure you do it all! Perth sits on the magnificent Swan River, named after the beautiful black swans found on the river. Perth is only 12 kilometres from the sea. The Swan River runs through the city on its way to the Port of Fremantle on the coast. There is such a lot of activity on and along the river. The locals and visitors alike make great use of it. You can walk, bike or skate along the riverbank and make use of the green space to picnic, rest or whatever you feel like doing. On the water why not try your hand at sailing (remember Perth hosted the America’s Cup between October 1986 and February 1987), kayaking or windsurfing. There is so much to do and see outside of Perth as well. 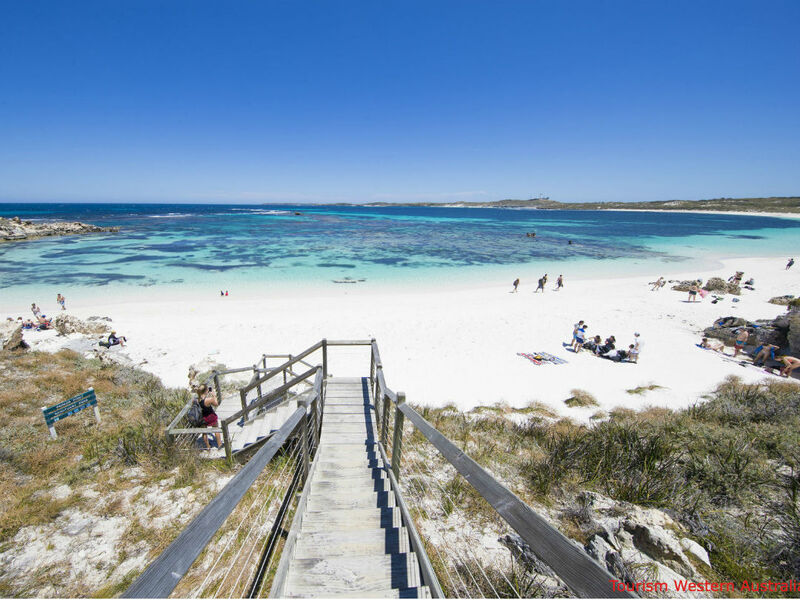 You have the Swan Valley Region, Margaret River, Wave Rock, The Pinnacles and close to home, Fremantle and Rottnest Island. Some of the trips are a long day but well worth it. Close your eyes and point to anywhere (North, South, East or West) around Perth and you will find something or somewhere wonderful to see or visit. What’s the Perth Weather like? Two types of tickets can be used on Transperth services, A SmartRider Card or a Cash ticket (Ticket Types). Cash tickets are available from ticket machines at train stations and ferry jetties and from on board buses. There are DayRider Tickets and fares for unlimited all day travel. Taxis are a convenient method for point to point travel in Perth. Throughout Australia dialling 13CABS (132227) will put you in touch with the nearest Taxi service. Taxis can also be pre-booked. As an alternate to a taxi a pre-booked limousine service is available and will normal meet passengers in the baggage collection area. Most of the major car rental companies have outlets located at Perth Airport, Avis, Budget, Europcar, Hertz, Redspot and Thrifty. (Vroom Vroom Vroom) There are rental car counters on the ground floor of all terminals. There are various parking options available for each terminal. There is so much to see and do in Perth. The city centre has 2 main malls, Murray and Hay Streets, stroll along these without the hassle of traffic. The city centre is being revitalised and the restoration of the Old Treasury Buildings in Cathedral Square is amazing. They are now known as the State Buildings. Be sure to visit Kings Park, over 400 hectares of bush giving you a great view of the city and Swan River. It has a great restaurant or take your own picnic, which ever you choose , be sure to sit, relax and enjoy it. A cruise on the Swan River is a must, you may choose to go to Fremantle this way. Like all major cities in the world, you will find amazing homes along the river, belonging to the rich and famous or perhaps infamous in some cases! It is a relaxing way (a great WA wine in hand should you desire it) to see and hear all about Perth’s early days. 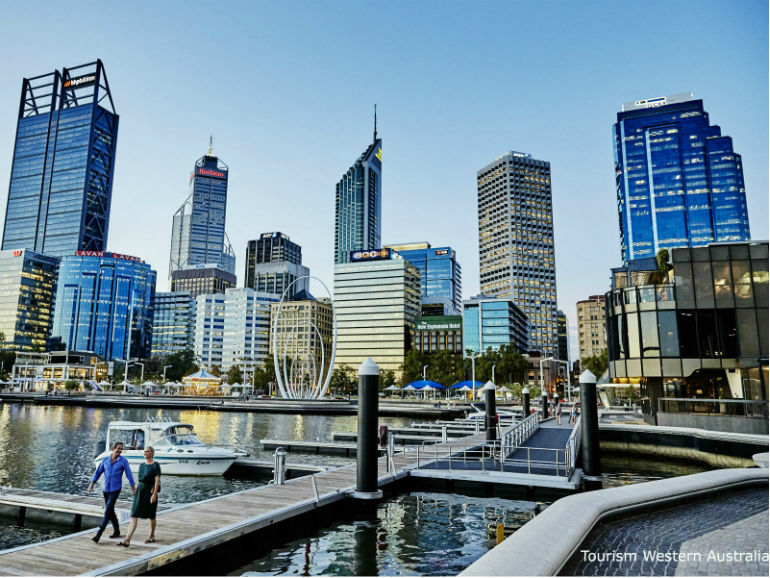 The river cruises to Fremantle, Swan Valley and Rottnest Island all depart from the jetties at Barrack Square as do the ferries to Perth Zoo and South Perth. Even if you are not going on the river it is still a great place to visit. Cafes, restaurants and public art are all found here. Elizabeth Quay development aims to let people live, relax and be entertained by the Swan River. It also has offices and retail space for businesses. Some people will be lucky enough not to have to go anywhere else each day! Perth has some great suburbs with their own character and charm so be sure to leave the city centre and explore some of these. Leafy suburbs along the river are Matilda Bay, Dalkeith, Claremont, Peppermint Grove and Mosman Park. Two other great suburbs not on the river are Mount Lawley and Subiaco. Now for one of my favourite things to do when I visit Perth, head to The Sunset Coast ( 19 beaches) and watch the sun set over the Indian Ocean. It will leave you transfixed, the image will stay with you forever. I am going to mention the Whale Watching Season here. Along the coast of Western Australia, you have the migration of the Humpback Whale (similar to the east coast migration) during the months of April to November. It has been christened the Humpback Highway! They leave Antarctica to give birth and raise their young in the warm waters of the Kimberley before returning to Antarctica. The number is around 35,000 including 3,000 carves on the return journey. It is the largest migration in the southern hemisphere. There are numerous operators during the season waiting to take you out to see these majestic creatures. Quokkas are small marsupials which gave the island its name, early settlers thought they were giant rats and called the island ‘Rats Nest.’ I love a good story! 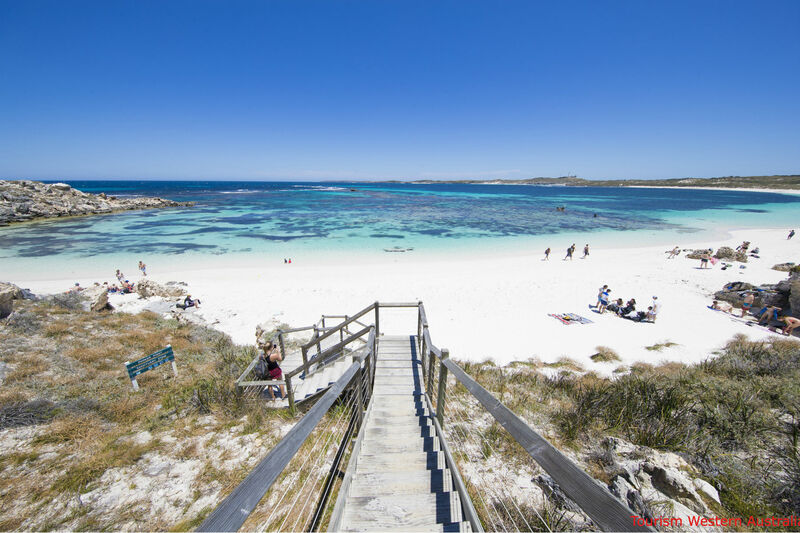 It is an amazing destination, located just 19 kilometres off the coast of Perth, not just the idyllic getaway, but also a destination for the adventurous. There are so many things to do both in the ocean and on land. There are wonderful bays with shipwrecks for swimming and snorkelling. In fact, there are 63 beaches and 20 bays, perhaps you will have one to yourself. The Shark (shipwreck) is great for kids, clear waters and only 50 metres from the beach! The Uribes wreck is also very good and for the more experienced, Kiryo Maru is resting in deeper waters. Rottnest is also a brilliant place for diving. There is another world down below in the limestone caverns just waiting for you. You can also go on cruises around the island to learn more about how nature works. Oh, perhaps a flight over the island might be more your thing! Time for more facts, over 135 species of tropical fish and 20 species of coral, you will be mad not to pop your head down to have a look! These corals are the worlds most southerly and are housed in more than 13 wreaks! Back on land, there is still lots to see and do. A great way to get around the island is to cycle as basically there are no cars on the island. The island is 11 kilometres long, 4.5 wide and to go around the whole island is 25 kilometres. The island has great trails you can follow on your bikes. For those who cannot cycle there is a bus that goes around the island and allows you to hop on and off as you please. It has 18 wonderful stops. Guess what? If you buy a bike and bus combination ticket, when you feel tired just leave the bike at a bus stop and jump on the bus! Where else in the world I ask? There is so much to see on the island. Head to the Rottnest Island Museum where you will learn all about the island’s history. Take the guided tour of the underground tunnels and learn about the role Rottnest Island played in the war. There are historical buildings and lighthouses to explore as well. Don’t forget to visit the pink salt lakes. There are many free guided walking tours you can do or follow the Wadjemup Trail and do your own walk. 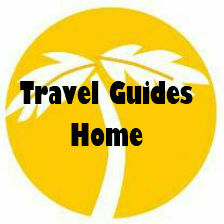 There countless activities to enjoy on this island paradise. There is an aqua park, mini golf, trampolines, an arcade with games (like the old days), a picture hall showing all the latest movies, lawn bowls, real golf and loads more! I forgot to mention the great surf and whale watching in season. Yes, you do need to stay more than a day! On the island you will find great accommodation for all budgets and great dining experiences for everyone. Swan Valley is only 25 minutes from Perth but you feel that you have steeped back in time when you visit the area. Swan Valley is Western Australia’s oldest wine region. Guildford, one of the gateways to the Swan Valley was founded in 1829 along with Fremantle, the port, Perth, the administrative centre and Guildford, the market town, together they formed the Swan River Colony. When visiting Guildford, you get the feeling that time has passed it by. Be sure to have a Devonshire Tea and think about how life must have been back then. James Street is an antique strip but also has lots of other interesting shops selling everything you need for your house and for that matter things you didn’t know you needed! 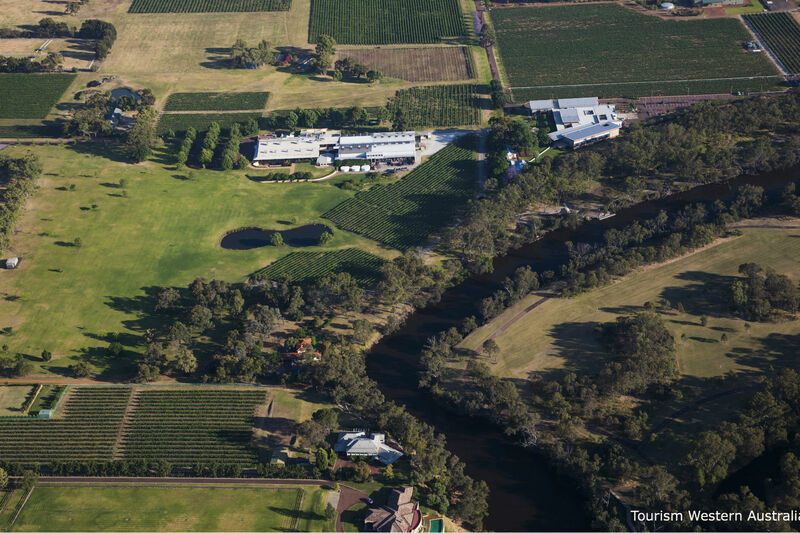 Swan Valley has a great Wine & Food Trail, it is a scenic 32-kilometre loop. Make sure you are hungry when you start as it has 150 places where you can eat and drink along with many roadside stalls selling their very fresh local produce. Cycling is a very popular way of doing this trail. The popular wine types of this region are chenin blanc, chardonnay, Verdelho, shiraz and cabernet and of course their great fortified wines. Guarantee there will be a wine there to suit your palate. 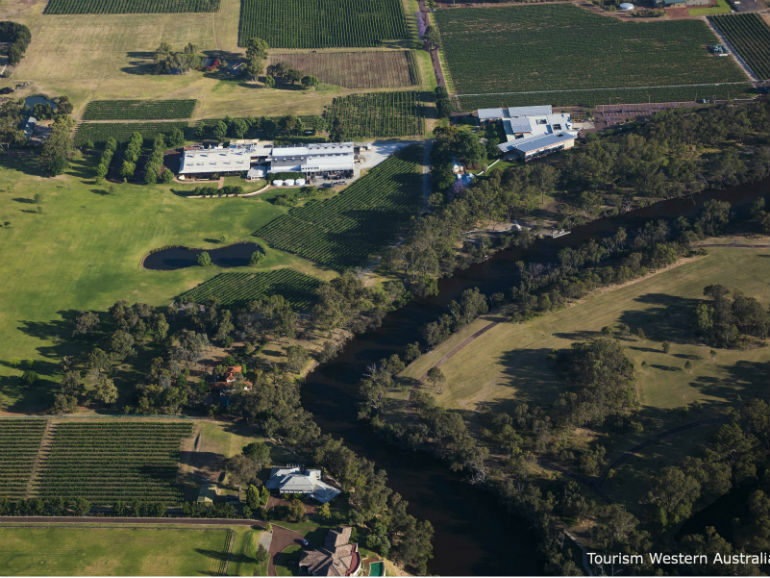 Swan Valley is easy to get to from Perth, travel by car, train, bus, cruise or go on a tour then you won’t have to keep track on how many wines you have had. 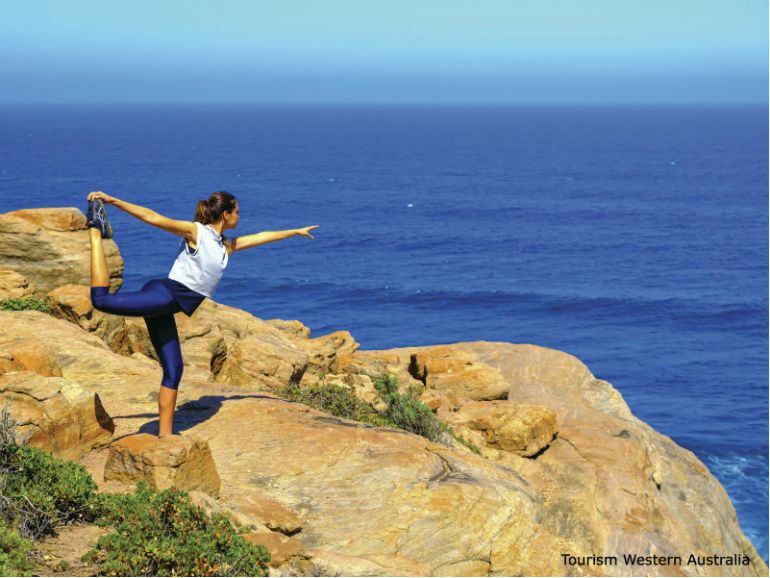 Fremantle, Freo to the locals, is at the mouth of the Swan River just 30 minutes from Perth. It is steeped in history and has protected its history at the same time embracing the future and alternative types. The result is a great city full of art, artists in many forms and very trendy bars and cafes. Freo’s vibe is wonderful. Streets are home to buskers, artists and a great range of bars and cafes. Whether you are on a backpacker’s budget or wanting something in the luxurious end of things Fremantle has something to suit everyone. This city is so easy to explore, mainly be foot or bike. 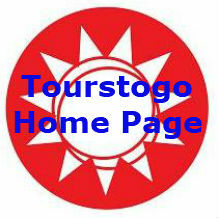 There are many trails to be explored and the information about them is freely available. There is also a free Fremantle Cat bus doing the circuit and stopping at all the points of interests so if you are getting tired just jump on when you see it! The architecture is wonderful with a lot of the old buildings made from limestone, mined from the hills and constructed by convicts in the 1800’s. One of the buildings, the Fremantle Arts Centre was built using convict labour between 1861 and 1868 and was used as a psychiatric hospital, initially called the Fremantle Lunatic Asylum. Another building is The Round House, the first permanent building built in late 1830. It is the oldest building still standing in all of Western Australia. 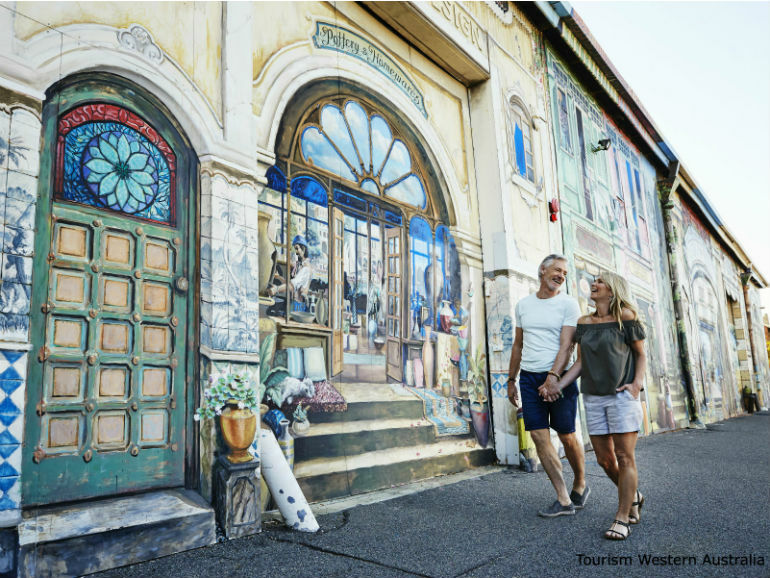 Over 150 of Fremantle’s buildings, described as ‘charming heritage sandstone buildings’, have been classified by the National Trust. Be sure to pause in front of them and have a look. If only the walls could talk! Be sure to have a walk around the West End. It is where you will find the Fremantle Prison, Notre Dame University, Bathers Beach, Esplanade Park and lots of historic and heritage listed buildings. Pick up a trail map to make sure you don’t miss anything. Like Perth, Fremantle has great beaches, giving you the perfect backdrop for sunsets over the Indian Ocean. Who doesn’t love a market? Make sure you visit The Fremantle Markets, they are housed in an old Victorian building located on the corner of South Terrace and Henderson Streets and have not moved in over a hundred years! Dining is great experience with such a wide variety of places specialising in different food and drink. You have Fremantle, North Fremantle, South Fremantle and East Fremantle and of course we cannot forget the popular Cappuccino Strip! The locals call it “Down South”. Margaret River is around a 3.5 hours drive south from Perth. It is a scenic trip as you can venture into the little beach towns along the way. Margaret River has more than 200 vineyards which produce 15% of Australia’s premier wine, some of the best surfing beaches in the country, Karri (eucalyptus ) forests and chambered caves. All this is a 55 square kilometre area. Margaret River is also the name of the town in this region. It is situated on the Margaret River. Confusing perhaps! The region is the Margaret River, the town is Margaret River and the river is Margaret River, at least it is easy to remember it all! The town of Margaret River is only 10 klms from the Indian Ocean. Down this way you find an eclectic mix of people, the surfers, wine growers, food producers and artists all mingle with each other. It is a small local community of 5,000 people. I’m not going to go into detail about the wineries and cellar doors, that is a story in itself. What I will say is how beautiful the region is with all the vines and wonderful wineries dotted along the country lanes. Make sure you pick up a “wine map” before you start! The hardest part of visiting this area for the day from Perth is deciding which few wineries to visit. Trust me you can’t do more than 4-5. Once you head from one to the next you will pass wineries you recognise and like and then you start to doubt your first choices! 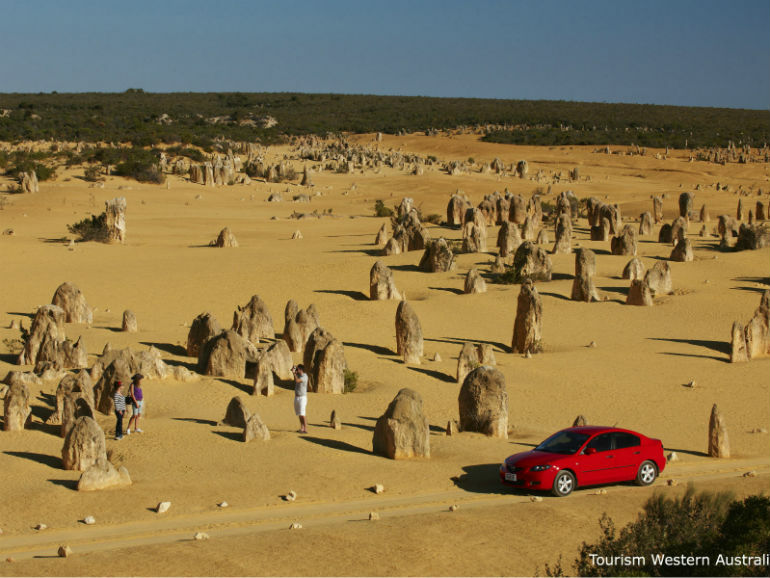 Under the Margaret River Region, you will find over 150 highly decorated limestone caves. Could this be the secret to their great wines? As with what wineries to visit, it is also a hard decision to choose which caves to visit. They range from completely easy, self guided, to very adventurous wearing hard hats and having to abseil to get inside them! The coastline is famous. For some breathtaking views head to Prevelly, near where the Margaret River meets the Indian Ocean. There are more than 40 surfing beaches ranging in degrees of difficulty. Surfers Point is the home of one of the most prestigious surfing competitions in the world, the annual Margaret River Pro. Of course there are wonderful swimming beaches as well! The Karri Forest is spectacular, it is made from a species of Eucalyptus, one of the tallest hardwoods in the world. It is only found in this region. I bet I know what you are thinking, I can’t do all this in a day trip from Perth, I need to go to the Margaret River for a 2 week holiday, right? I went for a week but needed another week at least! 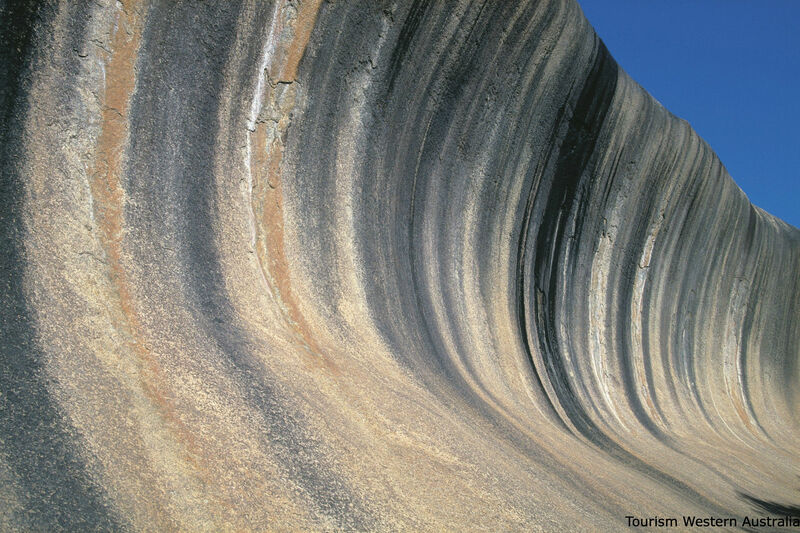 Wave Rock, located just outside Hyden, is another wonderful land formation that we need to thank nature for. 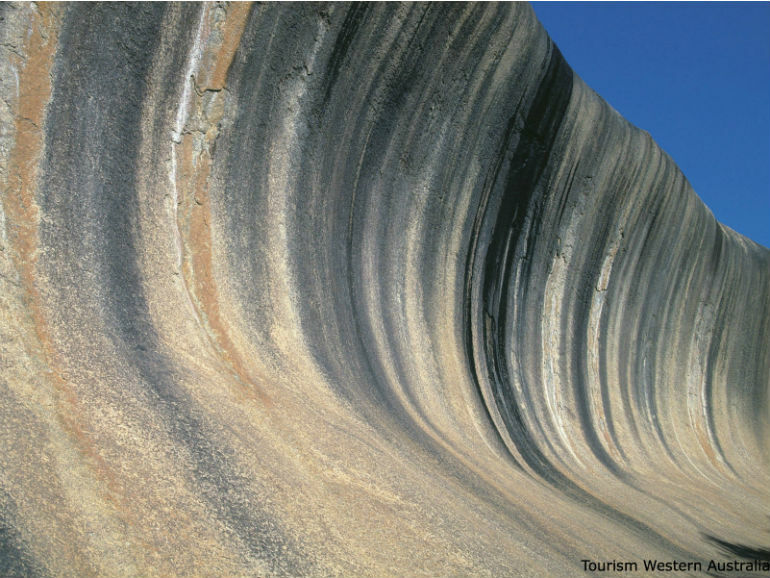 Wave Rock is an ancient granite formation over 60 million years old, and was shaped by being eroded by wind and rain. Western Australia certainly has its fair share of these. Wave Rock is 27 million years old, 15 metres high and 110 metres long. The colours are the result of water running down the rocks dissolving minerals. Make sure you stand at the base of the rock to understand the enormity of it. By standing here you will understand how big the surf waves are that need to be conquered to become a world champion! Remember surf has a mind of its’ own. Also take in the other view of Wave Rock from standing on top of it. It certainly gives a different perspective. There is a great walk you can do around the area so leave enough time for this. On the walk you will see other interesting rock formations, a favorite would have to be” Hippos Yawn”.